It was November 2016. My colleagues and I convened to discuss our biggest and best ideas for the various markets in the years ahead. I believed we could approach a point in a few years when global oil demand growth slows down. The world will not stop using petroleum anytime soon. But in 2016, it was already clear that developed market oil demand growth was going to drop. Long-run estimates from the International Energy Agency, the Energy Information Agency and OPEC show that technology and the “electrification of everything” will reduce the amount of oil developed economies use. Still, no one entertained the idea of peak demand. That’s because emerging markets are set to drive demand higher for at least the next 40 years. The certainty of that forecast piqued — or peaked — my interest. When I explained my thoughts, I figured a short-term demand peak could be only two or three years away. My idea rested on the strong odds of a crisis in emerging markets. Fast forward to today and we are faced with a situation, where the emerging markets are balanced in a precarious position that could plunge the world economy into crisis. The world’s debt accumulation is a disaster waiting to happen for emerging markets. Debt-laden emerging economies face significant risks: high oil prices, high U.S. interest rates, a Chinese economic slowdown and a strong U.S. dollar. The U.S. Federal Reserve even hiked its benchmark interest rate yesterday and the Fed chair is calling for yet another hike this year. This all spells trouble for emerging countries holding significant amounts of debt. 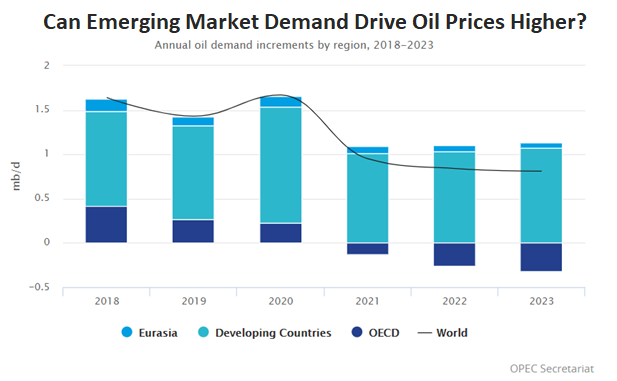 This chart of annual oil demand shows how important the emerging markets are for overall world oil demand. OPEC expects a slight dip in demand growth next year. After that, emerging market demand growth is expected to push global demand to new highs in 2020. Overall, I’m bullish for the long term. Global crude oil supplies are rebalancing, and a supply deficit may be looming. But the price of crude oil will fall if emerging economies cause markets to panic. That time has not arrived. But we shouldn’t grow complacent. If that time comes, it’s important to have a plan. Proactive investors should consider inverse exchange-traded funds (ETFs). Inverse ETFs let an investor profit when the price of an underlying asset is falling. For example, the ProShares UltraShort Bloomberg Crude Oil ETF (NYSE: SCO) goes up twice as fast as the price of crude oil goes down. It is not a good product for buy-and-hold investors. But it is good for active investors who want to “short” the oil market without actually selling short. « Previous Guard Robot-Maker Aims for a Safer U.S.